Discover the Fyle Valley on mountain bike! Unique and peaceful nature with rolling alternating Skånsk landscape waits for you. On the bike ride you will experience exciting cultural history with castles, churches and farms, and not least, farm shops with local produce. Our little more luxurious accommodation for the little smaller group or family. The cottage is located very beautiful right next to our pond. On the terrace next to the dam there is also a hot tub that you can sit in the evening. Bumberball, bubbleball, bubbleball yes, this sport has many names A fast-paced activity, where you can safely tackle your colleagues. Guaranteed laughter, speed and hard close combat. Bumberball is played on artificial grass. We can also come to you and perform the activity at the agreed place. You have a conference in our fresh conference room. New soft chairs for long conferences are of course. Here you also have access to canon, whiteboard, flip charts, paper and pens. Fruits and drinks are also available. Please inform your conference in advance. Our drop-in activities consist of adventure golf, frisbeegolf and football golf. These require no pre-order, just come here! For more info, press “Read more” under each image. 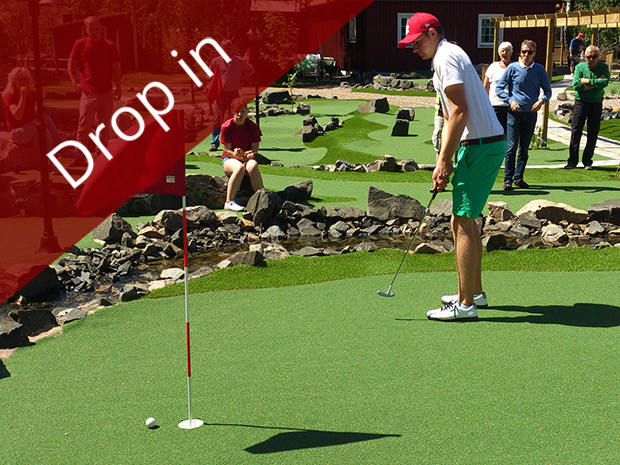 Sweden’s largest adventure golf fits all ages. The adventure golf is played on artificial turf as well as miniature golf, but the courses are designed as real golf but in miniatur. You play with mini golf clubs and balls. Our football golf course is a little different. The course has 18 holes, and most of the course runs around the adventure camp. Natural obstacles in the form of trees, branches and rocks. It’s challenging and fun and the amateur has the same chance of winning as the football pro. Our 18-hole Frisbee golf has been placed on historic ground. It has been a secret air base (War Airport No. 2). During the 2nd World War there were 100 men deployed here who handled Sweden’s border guard. Discover the FyleValley that was created during the ice-landing. Down in the valley a world full of greenery and exciting wildlife awaits. Here is the Fyle river. Furthermore, you will also experience the rolling Skåne farmland. Here you meet farms, castles, churches and local producers. 10:45 The cycle ride begins against Glass recycling and the Glass Shutters’ Orangery where you meet the glass master who recycles the recycled glass and you will experience beautiful objects created by recycled glass. At the café-bistro is the morning coffee served. Tors-Sun April 1 -31 May 11-17. Further towards Fyle wally and meets the magic landscape. A peaceful environment with its cultivated fields, livestock and rural life. The bike ride goes through small villages along the way. The second goal of the trip is over the open terrain in the Fyle valley. On the slope there are several protruding water sources, including Vitabäckskällan. The steep slopes and the flat bottom of the valley are cleared by melting water from the ice sheet. In Eriksdal you cycle past quarry quarries that are as loose as it was 200 million years ago. To the east lies Kurremölla, a geological sensation in the 19th century. Here you can find coal with fossils of leaves, cones and nuts from ginkot trees. In the field there is also plenty of iron minerals. At Fyleworks in Fyledalen, it has broken quartz sand – a few hundred meters from the village of Eriksdal – since 1938. The sand is unique because it consists of 99.5 percent of the mineral quartz. The sand is dried and ground to flour and is used for cement, roof tiles and filters for water and air. You will also pass some churches along the road that dates back to the 11th century. The churches are in Romanesque style. The churches are not always open but beautiful to look exteriört. In the middle of the Fyle Valley there is Banvaktens cafe. Here is served “gofika” and ice cream. Open 1 July -12 August 11-17 all days. Fyle vally can hardly be seen when traveling in the farming landscape surrounding the valley. But down the valley a world full of greenery and exciting wildlife awaits. The road down the valley winds through the steep, wooded slopes. Down in the valley, the pastures spread out with the still Fyleån in the middle. In the valley, the sounds of traffic are silent, now nature is heard. You can, for example, hear a nightingale that fights against the leaves of the leafy groves (fall in April to June) when dusk falls a spring night. Or the deer’s ancient easterly (September) in the fog late in the autumn night. Fyledalen offers experiences for all the senses. A glimpse of the scented sand dandelion on the dry lane, an eagle’s majestic escape across the valley or a silver splash from the ear of the river’s dark waters. In the valley there is a network of forest roads to discover on foot or by bicycle. By the end of your trip you will pass Sövde Musteri. There is the opportunity to buy Bonny Håkansson’s various drinks that he produces in his unique temple, which has won many awards. 8.30 After a good night’s sleep and breakfast buffet a short cycle ride awaits you through freight and forest landscapes to Snogeholms lake / Sövde lake. Here you stop for lunch and grill with a barbecue grill. Return to Adventure Camp and Home Travel. Clothing for weather. We have ponchos if you forget about rainwear. Always think about staying in nature. – Consider others who live in nature, do not worry unnecessarily. – Take care of land and vegetation, do not break branches of trees and shrubs. – Do not pick flowers, grass and mosses, enjoy those where they grow instead. Our tours go partly through nature reserves, where it is also forbidden to pick plants. – Keep nature clean, never leave garbage for you, it is so easy to bring it back to a trash can. – Do not fire out of prepared barbecue areas and do not use disposable grills in nature. – Do you meet horses stop and let the horse pass. Take into account hikers. At the accommodation you can wipe your clothes dry on the toilet. There is also a washing machine at the accommodation. Our little more luxurious accommodation for the little smaller group or family The cottage is located very beautiful right next to our pond. On the terrace next to the pond there is also a hot tub that you can sit and relax in the evening. The cottage has downstairs and upstairs with 1 double room on each floor. In the cozy living room there is a sofa bed and dining table and there is also a sofa bed for 2 people. Well-equipped kitchen with bar and o bar stools Fresh and bright modern toilet and shower room On the other side of the cottage you will meet nature and forest with nice walking paths and 10 minutes down to the lake of Sövdes beach. Add activities: Adventure golf 19 holes, Frisbeegolf 18 basket, Football golf 18 holes, Mountainbike. These activities need not be pre-booked.